Drainage is an important aspect that needs to be considered with any landscaping project. Drainage issues can cause erosion, property damage, damage to buildings and foundations, and they can be very expensive to repair. Depending on what your drainage issues are there could be a number of ways to address the problem and solve it once and for all. Is there water pooling up on your property? Without proper drainage in place your landscape and lawn areas can be prone to flooding, it can drown out your expensive plants, erode away expensive hardscaping, and even cause damage to your structures and their foundations. Silver Lining Landscaping is a landscaping company based out of Brownsburg, Indiana and serving the surrounding area. We specialize in installing lawn and garden drainage systems and offering solutions for properties with a drainage problem. Many of our clients properties suffer from poor drainage or have drainage systems that just weren’t implemented correctly from the start which has led to significant erosion problems, water pooling, soft spots, and flooding in their lawns, gardens and landscapes. We can help solve these problems. We offer erosion control services around lakes, ponds, and creeks where erosion is common and can cause damage to your shoreline. 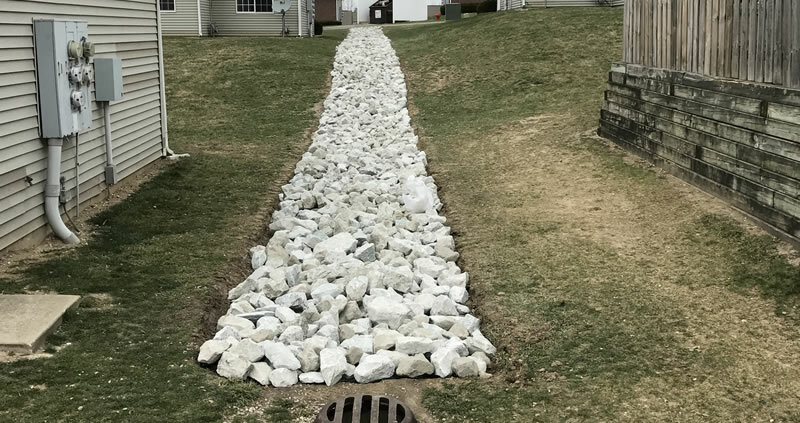 If you have a lake, pond, or creek on your property we specialize in the installation of riprap which is rock or other material used to provide protection along shorelines and creek beds, against water erosion. Regulate Your Irrigation System – Many irrigation systems are setup to deliver water to a lawn, garden, or landscape over a set period of time rather than on the needs of those specific plants. It’s a good idea to set your irrigation to meet the needs of your specific landscape rather than set it on a timed schedule. For example, if you’re irrigation system runs for an hour in the evening, but the plantings are sufficiently watered within 15 minutes, that extra 45 minutes of watering doesn’t make much sense and likely contributes to the poor drainage issues. If you’d like to schedule a consultation to discuss your drainage system or to correct drainage issues you might be experiencing with your property we’d be happy to meet with you. Please call (317) 902-5411 or fill out our online form and we’ll get right back to you.